L’Oreal Paris Rouge Caresse Lipstick (Rs 400/ 2.5 g), available across L’Oreal Counters , and also online. The L’Oreal Rouge Caresse Lipstick in the particular shade that I’m going to review today, i.e. Rock N Mauve, had been on my list for long, but somehow I never actually picked it up. So the last month when I was in Bangalore, my friend gifted it to me, and I have been happy ever since. 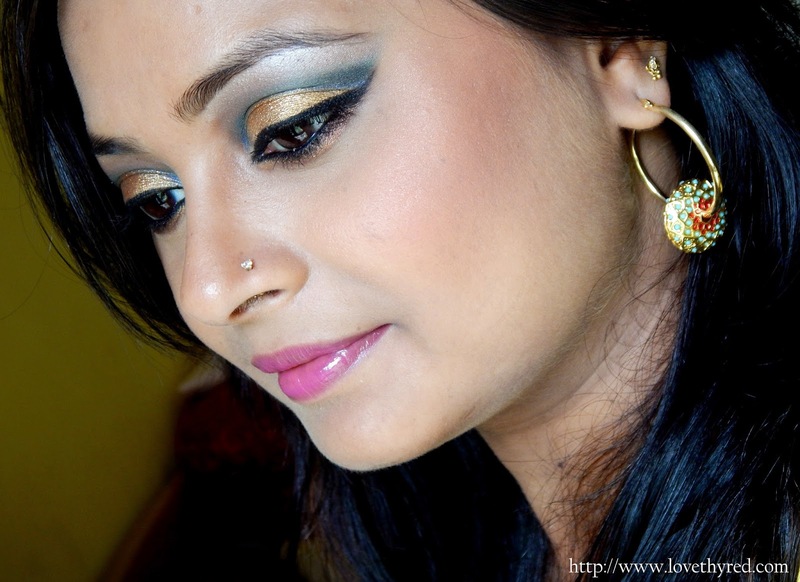 Read on further to know my views on the same and a FOTD I did today to pair up with this lipstick. The L’Oreal Rouge Caresse Lipstick comes housed in a transparent plastic tube with a color indicator on the top and a silver strip with the L’Oreal logo embossed on it, right where the cap locks.The cap of the particular piece I got, doesn’t shut properly and I don’t know if the fault is with just my lipstick, or is there in all of these Rouge Caresse lipsticks. You tell me! For the same reason, I would not like to travel with it just in case it comes off or something. I wish the packaging was as classy as the Shine Caresse lip colors. The lipstick itself, looks stiff in the tube, however, when you apply it on the lips, the texture is melting-ly soft and buttery, which was as a surprise to me. I instantly fell in love with the texture. The lip color is decently pigmented, and with a couple of swipes, you get medium coverage with a shiny glossy look. The shade Rock N Mauve is a beautiful mauve, leaning a lot towards purple and less towards grey, and will work well across medium to lighter skin tones. It is not exactly an effortless color for me because mauves sometime make me look sick and pale unless paired up with some heavy eye makeup and blush. The lipstick bullet shape (rounded at the top) makes application a bit tricky. I plan to use a lip liner underneath to make application as well as staying better and easier. My lips drank up all the moisture that this lip color provided, with a very comfortable lightweight feel. It wore for about 2 hours and also it does transfer a bit as well. But even after the color wore off , my lips felt very hydrated and nourished. It does not leave any stain behind. It neither feathered or bled which was great considering the soft buttery formula. Overall, The L’Oreal Paris Rouge Caresse Lipstick in Rock N Mauve is a beautiful purple-mauve color, with a glossy finish and comfortable hydrating wear . The lipstick delivers every single bit of what it claims and for the same reason, I would totally recommend these if you’re a fan of sheer,glossy lip colors and struggle to find comfortable formulas for dry lips. BTW i love this angle of your pics.. I have this shade , and it looks stunning on you girl. Love the eye makeup. i have this shade and i totally love it too, btw your eye makeup is awesome! !